Journey into the Forbidden Mountain and face the yeti! 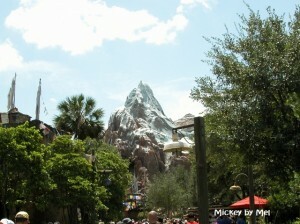 Today let’s take a ride on Expedition Everest – Legend of the Forbidden Mountain found at Disney’s Animal Kingdom. Here brave explorers take an abandoned tea train deep into the Forbidden Mountain to go in search of the legendary yeti. It starts out simple enough – up and down some smaller hills, a few twists and turns. Then you start an ascent where you discover that the yeti has other plans in store for you, he has ripped apart the track you were climbing! There is only one way to go, backwards! Your tea train heads in reverse into the mountain. You will eventually stop and move forward again – this time hurtling straight out of the mountain. Beware though the yeti is still lurking; waiting for an unsuspecting tea train like yours! Featuring over 4,400 feet of tracks and reaching top speeds of 50 miles per hour, this fearsome mountain was first opened in 2006. But perhaps most awe inspiring is the yeti. The audio-animatronic yeti is a feat to be seen. He is 22 feet tall and although he no longer operates in “A” (or movement) mode, he is still large, loud, and scary! Will you escape his fearsome clutches or will you be another lost party in the Forbidden Mountain? I have only ridden with the Yeti in “A” mode once and I can tell you it is a more intense ride when this huge yeti lunges out at you. While many have complained that they have never seen the yeti move, this feature might make it a little too intense for younger riders. And for those who want the yeti to move again, it will not be happening anytime soon. The movement of the yeti has caused some structural issues that, if he were to be re-activated, could cause major damage to the ride. The earliest that you might see the yeti move again (if ever) would be after a major closure and refurbishment to the ride since it would require engineering and structural changes. Having ridden it both ways, personally I don’t mind the strobe lighting and roars only. Expedition Everest gets your adrenaline pumping enough without adding a giant furry beast attacking you! Expedition Everest is a family thrill ride with a minimum height requirement of 44”. This is a popular attraction that draws large amounts of guests, consider using FastPass or the single rider queue. As you are winding through the queue take some time to examine the artifacts that are on display of Everest climbing tools, photos of Everest climbing parties, and local lore about the yeti. And here is your trivia for the day! Most people think that the main mountain that you see (and ride through) is a replica of Mount Everest. It is not a replica of Everest, the tannish colored mountain in the background of the main mountain is supposed to represent Everest. The main detailed mountain that you travel through is the Forbidden Mountain! 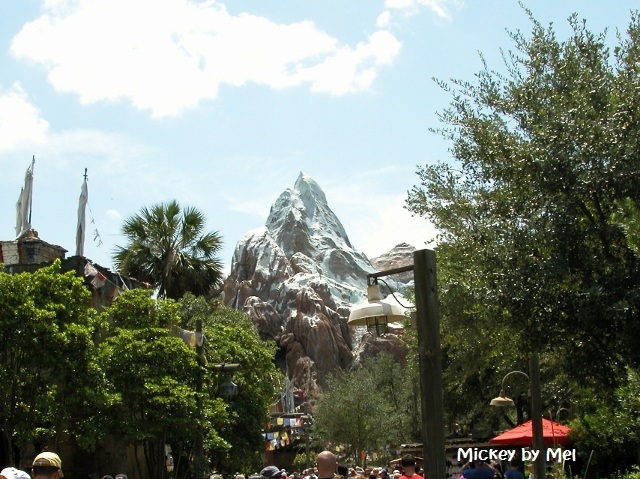 And standing at 200 feet tall, the Forbidden Mountain is also the tallest of the so-called “Disney mountain range” at Disney World as well as the tallest mountain in the state of Florida!